Looking for a fun classroom management solution to motivate your elementary students during the craziest times of the school year? Try Wonka Week! Perfect for teachers in 2nd, 3rd, & 4th grade classrooms to use before holiday breaks or at the end of the school year. Read Charlie and the Chocolate Factory and plan some candy-themed math & science activities for Wonka Week learning fun! Read on for instructions, ideas, and free printables. Wonka Week is my favorite go-to end of the school year activity, but it works equally well the week before Spring Break or any other time you’re anticipating squirrely children and need something a little different to calm the masses. 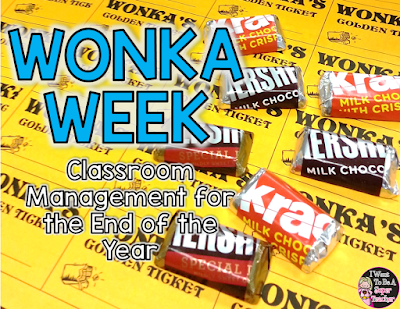 If you have extremely excited kiddos and need a little something new, try out Wonka Week using Golden Tickets for Classroom Management! Buy: a bag or two of small wrapped candy bars (not the vacuum sealed kind – the wrapped in foil-lined paper kind), and 10-15 candy bars or other “big” prizes. You can find the same candy bars I use in a large bag on Amazon HERE instead of buying 3 or 4 smaller bags at the grocery store (affiliate link). For the large prizes I buy candy bars at The Dollar Store or save up larger random items I collect during the school year. The large prizes don’t have to be candy. Anything special works! Print: the Wonka Tickets on yellow/gold paper. Put: Wonka tickets inside the special small candy bars (as many special candy bars as you have “big” prizes). You will have to fold them up and reseal the small candy bars with a glue stick. Cut: the rest of the Wonka Tickets out and put them in a secure baggie hidden from view. Display: the clear bowl full of small candy bars and the “big” prizes somewhere up high in your classroom – keep them visible but not reachable! For maximum effect, put these out a few at a time the week before Wonka Week. The anticipation will be palpable! Students who get a Golden Wonka Ticket in their small candy bar get one of the exciting giant prizes! Secret Teacher Trick: to make sure the Wonka fun lasts as long as you want it to, only put one or two special “Golden Ticket” bars in the bowl at a time. That way you can draw out the Wonka fun for as long as it is effective. 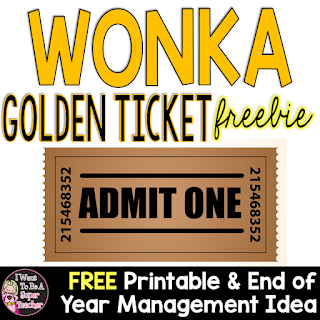 If you are interested in trying out Wonka Week in your classroom, you can download a free copy of the Golden Tickets I use here. 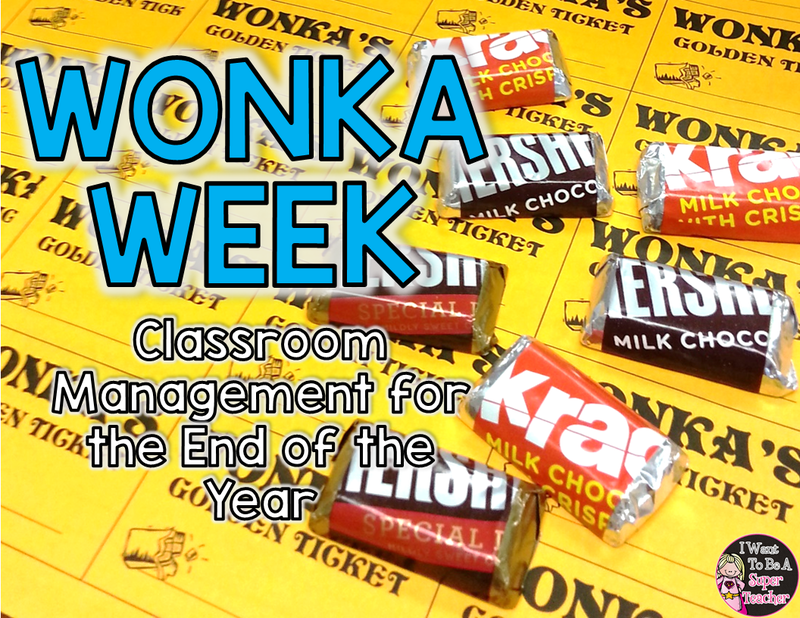 I use Wonka Tickets as our shiny new classroom incentives and integrate Wonka themed activities throughout the curriculum. The kids love anything that has any connection to candy so all of these activities are perfect for crazy weeks when you still want to actually teach something meaningful. 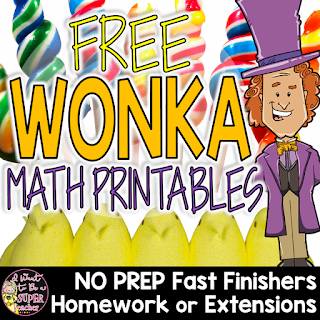 *MATH – I use these Wonka math printables for fast finishers, math contracts, bell work, and group problem solving during Wonka Week(s). You can try three of these activities (Candy calculators, Oompa Loompa Equations, and Golden Ticket Logic Puzzle) for FREE. Just click to download the freebie at the TpT store HERE. Need more Wonka math? The Wonka Math Challenges and Brainteasers set pictured below includes 42 Wonka and candy themed math activities. Since Wonka Week is typically a whole class affair, this set has similar problems on a variety of levels for grades 2-4 so all students have access to appropriately challenging math fun! 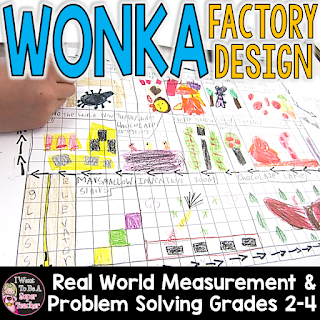 *ART/MATH – Design a new floor for Wonka’s Factory to practice measurement and mathematical problem solving skills. You can find 2 differentiated versions + an editable teacher copy to customize this Wonka Factory Design project for your classroom at my TpT store HERE. *SCIENCE – Candy-based science experiments are tons of fun! The one pictured below answers the question – What will happen to a Gobstopper when submerged in water over time? (I pretty much had extra cups, Gobstoppers, a sink, and some time to kill – but even with this not so exciting experiment – the kids were INTO IT! Anything that involves candy works wonders. You can also check out my WONKA Pinterest Board with ideas for Wonka themed learning activities, costumes, and fun stuff based on a candy/Wonka theme. I hope you can use this idea. Wonka Week is a fun way to get kids engaged during those crazy weeks before a break or at the end of the year! Previous Post: « Easy Peasy Pi Day: All you need is Yarn! I love this idea! I'm going to share it with my friends!